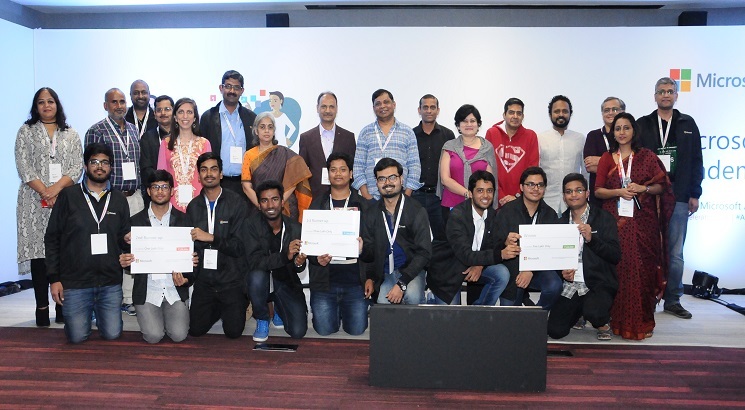 NEW DELHI, FEBRUARY 5: Microsoft India hosted AXLE, a Microsoft Academia Accelerator an annual showcase of collaboration between Microsoft and academia. This year’s AI for Good theme packed in a rich agenda of keynotes, tech talks and student projects that showcased innovative ways of using technology to solve real world challenges. The event brought together Computer Science faculty, Microsoft leaders and employees, several industry influencers and students from top engineering colleges of India who showcased innovative ways of building state of the art technology to predict or manage natural disasters better. “Academia Accelerator aims to provide insights to students about important technology trends and practices and adding industry know-how to the existing Computer Science curriculum. At Microsoft, we see unique ways of how AI can be used to improve products, services and how fostering the dialogue on the beneficial use of AI can help in enabling long term sustainable solutions to large scale challenges.” said Chitra Sood, Director Business Management, Microsoft India (R&D) Private Ltd.
“India has immense potential to be a hub of development for AI driven solutions. Microsoft’s engagement with the Academia reiterates our commitment to engage and enrich the innovation journey of students in Engineering schools. It makes AI and its benefits accessible and drive digital transformation at the grassroot level. We are excited by the enthusiasm shown by students using AI and anticipate that they will apply their learnings from this challenge through their career,” she added.